One of the most seismic shifts in kit design occurred in 1991. Adidas, of Trefoil logo fame and enduring sleeve stripes - with very few exceptions to this rule on football shirts - dispensed, overnight, with both of these immediately recognisable elements. The inception of the “adidas EQUIPMENT” logo, and related bold shirt styling, shocked sportswear and football fans alike. My memory of this drastic changeup was that it began with the largely sublimated 1991-92 Liverpool shirt, but this may be subjectivity rather than fact. Regardless, it was a staggering development, and one that took its time to settle. That settling process was aided by the second generation of these “over-shoulder bar-stripes” shirts, and amongst these was the United States of America (USMNT) 1992 Home. 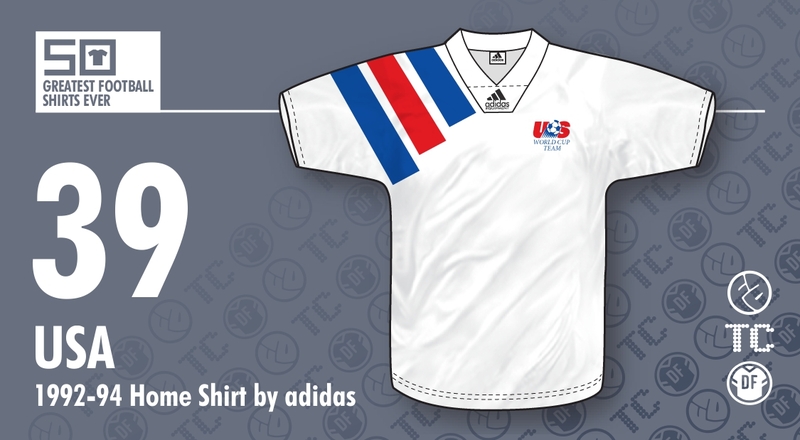 With sublimation dispensed with and replaced with cut out stripes mounted onto the shoulder, and a newly raised adidas Equipment logo in a central position on the V collar, this shirt was a more substantial affair than the first incarnation. This one was to be taken seriously. As it turns out, the USA had worn this style - complete with the second gen improvements - way back in the summer of 1991, albeit with an older POTUS-alike crest, notably in a friendly against Sheffield Wednesday in Philadelphia. I have no idea how or why the US team managed to carry this version so early, but they’re very lucky to have done. Because, befitting its inclusion in our countdown, the shirt was wonderful. The alternating patriotic stripes - blue/red/blue - contrasted strikingly with the stark white (sans-watermark), whilst the black adidas logo adds a certain sobriety to the appearance. The new national side badge wasn’t to everyone’s taste, but it was simple and functional and didn’t remove the focus from the inspired application of a controversial template. With hindsight, there is an exciting edge to admiring of all of the early Equipment (or “Performance” logo) releases due to the knowledge that most competition regulations today would ban branding of that ball park of footprint. But, even adding this spice, so few of these, in effect, experimental and guinea pig manifestations of the philosophy really stand the test of time. The USA 1992 shirt does. It’s not the only included example worn in a victory over England, as it happens, but it retains distinctive aesthetic glory to complement that famous win.